This Psalm describes four categories of people who are rescued from a life-threatening situation, and are thus required to express their gratitude to the Almighty. 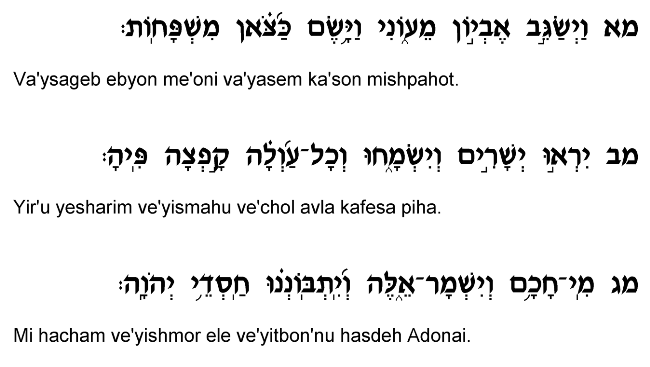 As indicated in verse 22, these people must bring "Zivhe Toda" – thanksgiving offerings in the Bet Ha'mikdash. Nowadays, in the absence of the <?xml:namespace prefix = st1 ns = "urn:schemas-microsoft-com:office:smarttags" />Temple, people who are rescued from one of these situations are required to recite the "Birkat Ha'gomel" blessing in the presence of a Minyan, to express their sense of gratitude and indebtedness to the Almighty. 1) Traversing a wilderness (verses 4-9). Desert conditions obviously pose the risk of hunger and thirst, and desert travelers are also likely to lose their way. Those whom the Almighty guides safely to inhabitable climates must give thanks for surviving the harsh desert conditions. 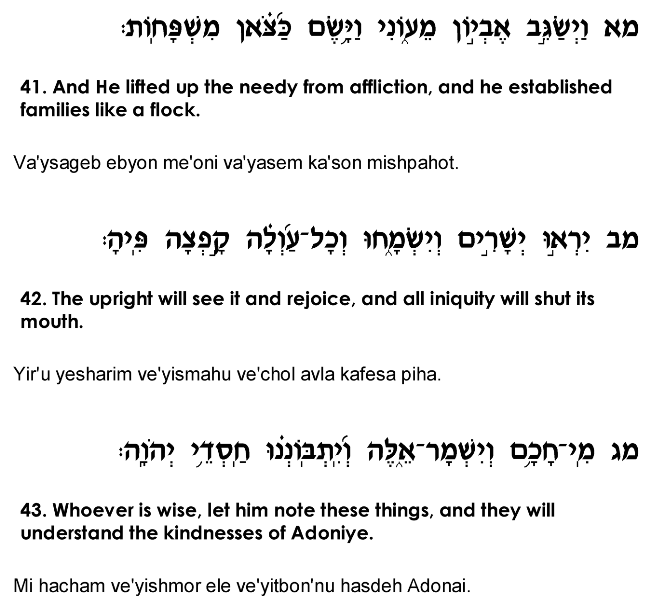 2) Captivity (verses 10-16). The Psalmist describes captivity as "darkness" and "the shadow of death," and freedom from prison as "breaking brass doors and iron beams." Most captives do not emerge alive from enemy hands, and thus one who somehow secures his freedom must bring a thanksgiving offering. 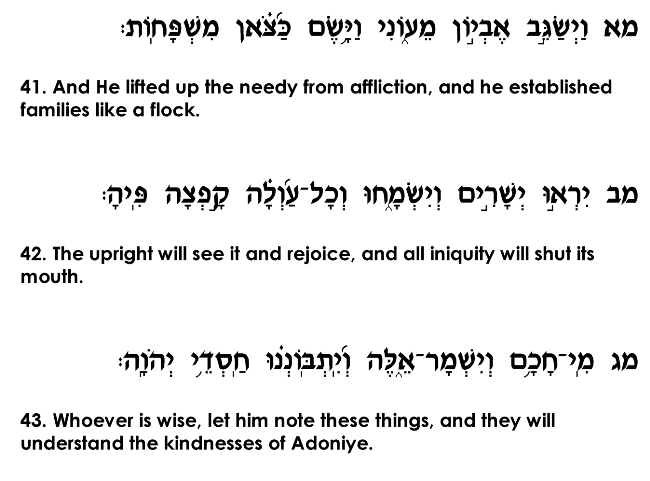 3) Grave illness (verses 17-22). Verse 18 speaks of a patient reaching "the gates of death," the point where there seems to be no possibility of recovery. Recovery from illness is a miraculous event, at times even a kind of quasi-resurrection, which warrants a genuine expression of gratitude to the Almighty. 4) Ocean voyages (verses 23-32). Conditions at sea are dangerous and unpredictable; a ship sailing into a storm can be easily overturned. Those who land ashore safely must give thanks to God for accompanying them along this perilous journey. The concluding section of this chapter (verses 33-43) speaks in general terms of God's ability to reverse fortunes in an instant. The author describes rivers turning to an arid wilderness, and deserts transforming into flowing streams of fresh water. Likewise, dignitaries and noblemen can suddenly fall into shame and humiliation, whereas poor peasants can often rise to glory in but a moment's time. The refrain that repeats itself numerous times throughout this chapter admonishes people who have experienced salvation, "They shall give thanks to God for His kindness, and speak of His wonders to people." The thanksgiving offering in the Temple was to serve as a forum for publicizing God's kindness and bringing others to recognize His compassion. One who has been rescued from trouble is thus obliged to not only express his gratitude, but to do so in a public fashion, thereby helping to glorify God throughout the world.